The picturesque Doon Valley, bound by the Ganga in the southeast and on all other sides by mountains, is known as the home of litchis, a public school named after the valley, and the Indian Military Academy. 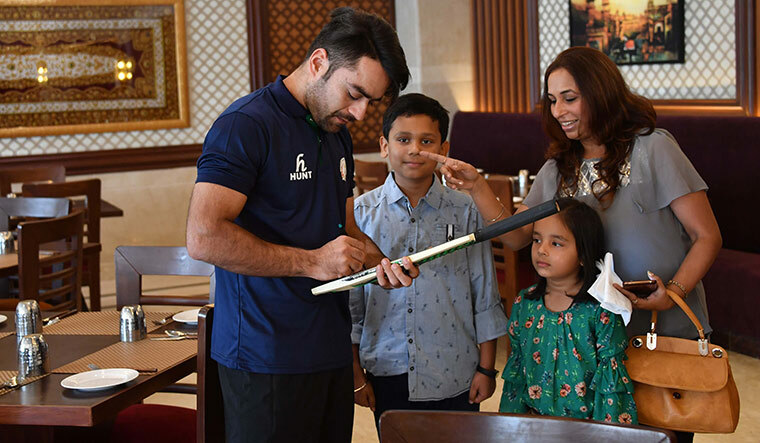 It is now associated with cricket as well, thanks to the spanking 25,000-seat Rajiv Gandhi International Cricket Stadium in Dehradun, which is the Afghanistan cricket team’s home ground away from home. The exploits of Rashid, 19, have already made him the poster boy of Afghan cricket. He is No 1 in the ICC’s T20 bowler ranking, and No 2 in the ODI ranking. It is a strange choice as the training base of a visiting national squad—for Dehradun has never hosted a First Class match, let alone an international match. Also, Afghanistan’s preferred base has been Greater Noida. Dehradun, however, has worked well for the Afghans, who recently whitewashed Bangladesh 3-0 in the T20 series held in the city. The stadium in Dehradun has also been their training base as they prepare for their historic first Test against India in Bengaluru on June 14. The bus journey from their hotel, on the outskirts of the city, to the ground takes 30 minutes. After the first T20, the players returned to their rooms way past midnight. As it was Ramadan, they washed themselves up and broke their fast, and went to bed only after 4am. THE WEEK met the team on a rest day. A few players and officials of the Afghanistan Cricket Board were in the hotel lobby, while a courier waited outside to deliver a package to a player. Both the courier and the package went through stringent security checks, as the Afghans watched impassively. Security checks and safety drills were part and parcel of their lives. ACB officials in the lobby were working their phones to make arrangements for the team’s journey to Bengaluru. They spoke not just in Hindi, but in Pashto as well—the ACB had set up a makeshift office in the valley. The officials and the players appeared calm and composed, and not overawed by the prospect of taking on the No 1 Test team in the world. Afghanistan has come a long way in cricket in the past nine years. Theirs is a success story of passion for the game aided by an efficient administration. For the Afghans, cricket has become much more than a sport—it is an oasis of joy for the war-ravaged nation. Players are celebrities, and they earn a comfortable living. The past decade saw Afghanistan rising through the ranks to become the best team among associate members of the International Cricket Council. It played its first ODI in April 2009, against Scotland in South Africa. Its first T20 international was against India in Colombo in February 2010. Afghanistan became a full member of the ICC in June last year. With the growth of cricket in the country, several Afghan players have attained star status. There is Nawroz Mangal, the first skipper; Asghar Stanikzai, middle-order batsman and the current captain; and Shapoor Zadran, the pacer known for his flowing locks and long run-up, to name a few. The current Afghanistan team is a mix of the young and the experienced. Over the years, the ACB has done well to develop homegrown talent; teen sensations like Rehman and Rashid are testimony to that. Middle-order batsman and off-spinner Mohammed Nabi was part of the first group of players who donned the Afghan national colours. He comes from a well-off family that moved to Peshawar during the Soviet invasion of Kabul. He learnt his cricket there. His calm presence has been vital in maintaining the team’s balance as it took rapid strides. Nabi has taken on the role of the experienced senior who guides greenhorns—something he and his generation never had. The series against Bangladesh has been thrilling. The Afghans outclassed the Tigers in Green, with Rashid Khan being the wrecker-in-chief. The exploits of Rashid, 19, have already made him the poster boy of Afghan cricket. He is No 1 in the ICC’s T20 bowler ranking, and No 2 in the ODI ranking. In February this year, he became the youngest ODI bowler to top the ICC ranking. In March, he led Afghanistan to victory over the West Indies in the final of the World Cup qualifier, and became the fastest to take 100 wickets in ODIs. It is not just how he spins the ball that is making heads turn and wickets fall. It is the entire package—Rashid’s expressive face, his twinkling eyes and his celebration after every wicket, not to mention his useful batting skills. Rashid was the second leading wicket-taker in this year’s IPL—scalping 21 in 17 matches. His performances have transformed him into one of the world’s most sought-after T20 stars. In the past one year, he has played in the Bangladesh Premier League, the Caribbean Premier League, Afghanistan’s Shpageeza Cricket League, the Pakistan Super League and the Big Bash League in Australia. He has also been signed up by Sussex Sharks for playing in the T20 league in England later this year. Rashid, who hails from a working-class family in Jalalabad, has also become Afghanistan’s first million-dollar cricketer. He was snapped up by Sunrisers Hyderabad for Rs 4 crore last year and for Rs 9 crore this year. A day after he finished the IPL season with Sunrisers Hyderabad, he flew to London. He was part of the ICC eleven that played a charity match at Lord’s to raise funds to rebuild the stadiums in the Caribbean that were damaged by hurricanes Irma and Maria last year. He returned to Dehradun in three days, ready to bamboozle the ill-prepared Bangladeshis. The cricket world is bedazzled by his bowling. Spin legend Bishan Singh Bedi said he was enamoured of Rashid, while Sachin Tendulkar declared him as the best leg spinner in T20. Shane Warne, the greatest leg spinner ever, said Rashid’s bowling makes him “proud” and “excited”. Rashid is the mainstay of the Afghanistan team, but the focus is on Rehman, too. 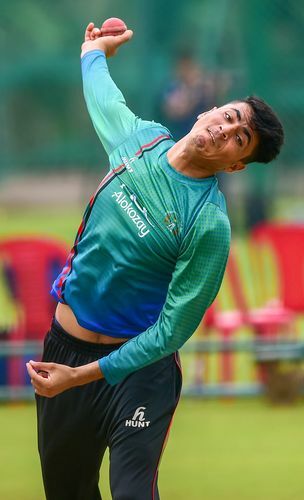 The off-spinner has had spectacular successes at the Under-19 level and was part of the Afghan squad for the Under-19 World Cup. His good show in the tournament had Kings XI Punjab buying him for Rs 4 crore for this year’s IPL. Rehman says his idols are Sunil Narine and Ravichandran Ashwin.